Wright State’s Sydni Callahan scored the game winning goal against St. Bonaventure. 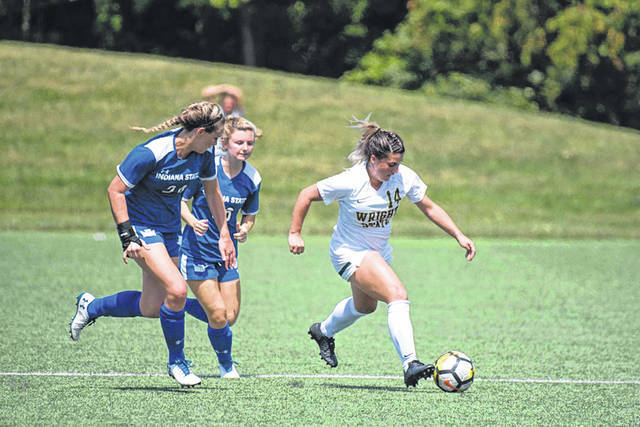 OLEAN, N.Y. — The Wright State women’s soccer team kicked off a three-match road trip Sept. 7 when it visited St. Bonaventure, and the Raiders began the road trip by knocking off the Bonnies, 2-1, in overtime. The win is the first of the season for the Raiders, and was highlighted by great defensive play. The match did not start the way the Raiders had hoped. Just four minutes into the match, St. Bonaventure’s Sydney Cerza put a shot past Maddie Jewell to put the Bonnies on top early. The Raiders would respond, however, especially on the defensive side of the ball. The early tally would be the only Bonnie shot on goal for the entirety of the first half. Offensively, the Raiders managed a total of eight shots in the first frame, and finally pushed a goal across in the 41st minute off the foot of Destiny Johnson. Her first goal of the season knotted the match at one at halftime. The match evened out in the second half, with both teams picking their spots to move to the attack. The Raiders continued to apply the defensive pressure, not allowing St. Bonaventure a shot on goal in the second half. Second-half shots were 6-3 in favor of the Bonnies, but neither team was able to earn a deciding goal, so the match entered overtime. In overtime with time winding down on overtime period number one, the Bonnies had managed only one shot through the period. The Raiders made one last offensive push with under 30 seconds remaining in the first overtime, and their third shot of the overtime period off the foot of Sydni Callahan found the back of the net to give the Raiders the victory. Aaliyah Patten once again led all shooters with three shots, and Naomie Guerra made her return to the team by registering a shot on goal.